Hey there! Thanks for dropping by Neo-Reductio-ad-Absurdum! Take a look around and grab the RSS feed to stay updated. See you around! BEAMSHIP. Sighting, Footage, Description, Perception and Post-Effect. HAPPENING/ I was feeling uplifted and grounded after three days in conference with the New Humanity Movement in Candem Town, London. Present were some extraordinary beings sharing experience, knowledge, discoveries and explorations on matters –that matter, but are often far from 3-D matter- covering a broad spectrum of realms, tasty practical meta-physics and else. The Princess of Japan Kaoru Nakamaru, Time-keeper Mazatzin, Konstantine Pavlidis, Dr Rauni Kilde and several more. POST/ I returned home on Monday. On Wednesday, the 16th of April 2014 at 2 pm UCT, I stepped out into the balcony. Laid back on a chair facing north and looked up at the sky above me. An airplane chemtrailing was passing by. My heart-felt thought was ‘when is this nonsense atrocity going to stop’. From peripheral view, my left eye caught a bright beam of light …and there it was, a most extraordinary craft/beamship! SIGHTING/ It seemed to be about half a mile west at most, at a height far lower than airplane taking off from Standstead. Sort of above the northern part of Hackney Downs and Stoke Newington. My split-first thought was of course ‘balloons gleaming with the sun’ but word NOT ! I could clearly see its structure! SHAPE/MATTER It was a combination of metal, transparency, white light, and silver tones originated from what seemed like a liquid crystal plasma energy. It had no fix shape but had a clear elliptical form with what could be considered boundaries made out of unequal morphing facets that where changing right before my eyes into the different medium above..yes, including the facets completely disappearing and showing what seemed an empty interior of the craft, or filled with the plasma energy -so to speak- at times. It was blinking, twinkling, sparkling bright bright bright as the light seemed to reflect from its multiple organic facets beaming to every direction. MOTION/FLIGHT Parallel to the ground, moving north in a straight line. HOWEVER, there was else that was most peculiar. As said, the ‘form’ was elliptical or perhaps circular -to a certain extend considering the morphing external facets- and less so the top and bottom of the craft. Let’s see… i can show it with my hands but how can I describe the rotation…mm..It was rotating horizontally to the ground at some 5 seconds per rotation constant. However its axis did not seemed to be within the transparent/crystal middle, it was more like there where 2 central axis rotating face to face with one another, together creating this 1 ship. IMPRESSION/ What I observed was of extraordinary beauty, sweetness, and 100% other-worldly, a scintillating morphing form of a ship. I felt a big sense of blissful tranquility. I notice I was not really breathing, that calm I was. This was contradicting my excitement. Was I excited? YES! But my body responded differently, I was well aware of this. Indeed I felt very lucid and at the same time enthralled in a blissful sense of awe. As an art, science, nature and technology lover, I have seen so very many wonders expressing these fields throughout my life, but nothing ever even closely resembling this craft. Even top 3-D special effects coming out in football-field size projections are child-play rudimentary in comparison. SHOOTING/TEK Grab the camera. Yes. No. Yes. No..you’ll miss the sight…but I do. After a good 1 ½ minutes or so, I run for the cam. Of course no time for tripod. Although the craft had moved further away, I was able to film it into the distant north…still and throughout blinking sparkling twinkling bright bright in the clear blue sunny sky. My technology is so limited …er..what can I say now when following this even the Hubble Telescope would seem limited.. but you know what I mean. I used a Flip MinoHD 720p 30 frames utter crap camera –yes complete crap because at the size of a small mobile phone it contains no stabilizer components whatsoever, so to shoot some form of unshaken images without tripod is impossible, and far more so if the zoom is used. I tried my best. At some point I run to a different window. The images, on the run, are quite funny but I had to edit some out because I filmed myself reflected on 2 mirrors, and I was naked ! Not that I mind..but it would be censored on utube. I also cut a bit of the distant blue sky at the end when cam was out of frame. POST FEELING/ The days following I have felt a gentle and quite subtle sense of expansion in consciousness, heart sensation and a knowing –don’t know knowing what, but something else – very uplifted and calm…and as if my size and my environment had expanded covering not just my immediate vicinity but the cosmos as well. It feels weird but comfortable. Do I feel physically stronger? Unfortunately, no. But encouraged on life exploration, definitely. Also, I have been hearing tones, triggered during the sighting and continuing till today on and off. This however is not so rare for me. POST-PRODUCTION/ When days later I took a closer look at the footage on the computer and zoomed into it, once again I was instantly submerged into that sense of wonderment..multiplied..as I was now able to look into it frame by frame still by still. I could say I was even shocked at the discovery of what the camera had captured, the shapeshifting –to a certain extend-. It was hypnotic, bright colours in mauve pinks greens and turquoise as well as the more solid ‘metal’ shades…and when a contrast filter was applied, there seems to be several other smaller crafts coming in and out of the main vessel. Their speed must have been extraordinary, as it’s hard to catch them on the vicinity of the craft from one frame to another. There are 30 frames per second, so you can do the maths. EXTRA/ The airplane can later be seen on the footage and it gives a good perspective as to the size and brightness of the object. In fact, although the airplane was clearly visible to my sight, one cannot see it on the screen. That’s how large the ET vessel/beamship was. I have not used that word before, but that’s what it was, a ship beaming. Another beautiful psychic lady I had met at the conference, and with whom I had long chats and plans for future meetings to pick up on C-5 Contact –that is, ET human initiated contact- had the previous day asked for us to receive a sign -since she is long retired from psychic abilities so to speak-, to be allowed to film upon their appearance. Not knowing this, she was the first person I called. She was astounded as to how quick the seeming response had come. Yes, C-5 Contact is an open possibility. Stay tuned. FEEDBACK/ And enjoy the video. Its close-ups like a meditation get me straight back in the zone. Does it do something to you? if so, please share your comments here. Be aware! 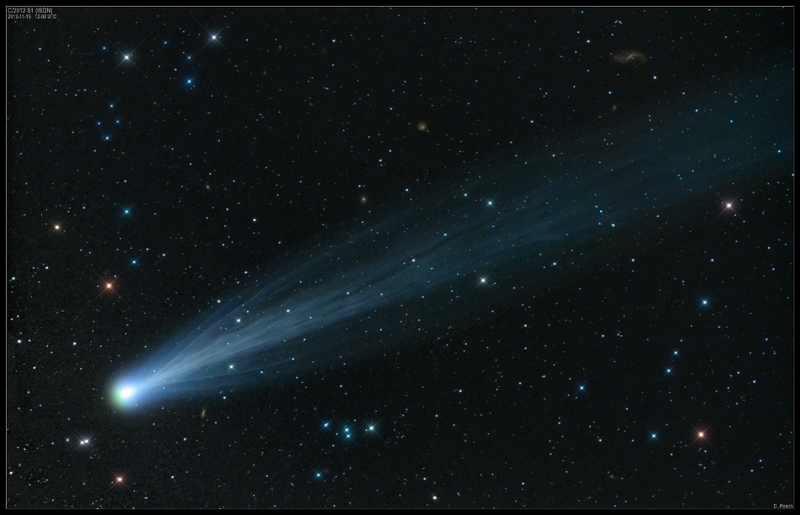 Ison is upon us to spur transformation. Mind boggling that the so called comet Ison, being a major galactic scale new type of event approaching our planet, yet very little is said by media, authorities, scientists, astronomers…indeed very little is known… but Ison is here to STIR our SHIFT ! With Ison’s inception into our planet upon us, I would like to share with you all this Gaia Amans VERY SPECIAL TRANSCRIPTED MESSAGE that offers much INSIGHT and PERSONAL ORIENTATION regarding this major event. Also in reference to http://spaceweather.com and supporting the transcripted message above… The so called comet Ison underwent yesterday 15th Nov 2013 a sudden and major brightening outburst of its now riotous tail. Both NASA and ESA say ‘We do not have a clue as to what’s going on’, but at least they now acknowledge that much. DO NOT AWAIT FOR IT TO FALL UPON YOU, INDUCE IT TO MAKE IT HAPPEN. A QUEST… SPECK OR SPARK?